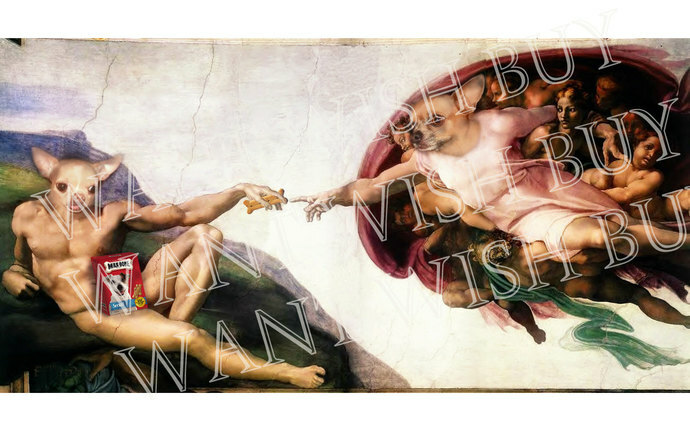 This is a 13x19 inch print of Michelangelo's Sistine Ceiling painting called The Creation of Adam. Only your pets are the stars. Here are featured 2 chihuahuas - litter mates. If you have 2 favorite pets this would make a great parody print of your little heavenly creatures. I would need a few photos of your pets that are clear and decent resolution. This is printed on 13x19" satin photo paper. Suitable for framing or just hanging on your wall. Contact me for more oversized prints of your pets on Great Masterpieces. Happy Holidays.